Malthus was the first person to make the connection between increasing human population causing problems, correct? And, of course, Margaret Sanger was the first to teach poor women about family planning. Both of these notions about the history of family planning are wrong. These two firsts actually belong to people who have almost been lost to history. Hong Liangji was a minor governmental official who lived in the Yangzi Valley of China in the 18th and early 19th centuries. He wrote several essays about politics and other subjects. In an essay from 1793 titled “On Governance and Well-being of the Empire” he voiced his view that increasing population would interfere with peaceful rule. 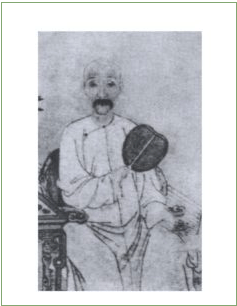 Apparently he felt that it was his duty as a Confucian to criticize the emperor. The emperor did not receive this well; he ordered that Hong be decapitated. Fortunately the sentence was reduced to banishment to a minor post. The background to Hong’s writing was that highly productive new crops allowed China’s population to grow rapidly. This was welcomed by the government, but was recognized by a few as being potentially problematic. “But in the matter of population, it may be noted that today’s population is… not less than twenty times as large as that one hundred years ago.” Hong wrote. A twenty-fold increase may have been an exaggeration, but his was definitely a time of very rapid population growth. 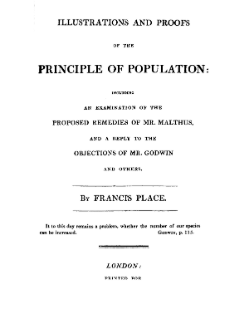 Five years after Hong, Malthus published: “An Essay on the Principle of Population” in 1798. It is no wonder that we usually give Malthus credit for being the first to raise the alarm about population, however, because Hong wrote in Chinese (which few westerners understand), and he ended up in obscurity. Apparently many rich women knew about “pessaries” to prevent pregnancy, similar to what Place described. However he was the first person to pass this information on to “…the socially less privileged.” One of his pamphlets was named “To the Married of Both Sexes of the Working People and Similarly the Married Sexes in Genteel Life.” The pamphlets were distributed widely throughout England, but the establishment called them “diabolical handbills”. Place’s personal life is interesting, if perhaps antithetical to his later interest in family planning. He came from a poor family, married at age 19 (his wife was just 17) and they had 15 children! of whom 5 died young. Place educated himself by reading voraciously. He started a successful business that he turned over to his children so he could be politically active. Place’s goal was to improve the lives of the poor. He collaborated with some well-known friends, including Jeremy Bentham and John Stuart Mill. Large families and rapid population growth affect both society and the individual. Hong wrote about the former; I have not been able to find out much about his personal life. Place was concerned about both later in life. His only book: “Illustrations and Proofs of the Principles of Population” was inspired by Malthus.